Many thanks to all the contributors to this issue, who have once again ensured a wide variety of articles and photos. the site of the Diocese of Pretoria. You will recognise the picture in the top right hand corner of the homepage of this site. More news about the diocese concerning the Archdeaconry of Pretoria East: a property has been bought in Willow Glen, where a new church will be built, and Vernon Foster has been appointed as a deacon at Corpus Christi Garsfontein to establish the Willow Glen congregation. Perhaps talking about Ox braais and Stations of Service does not seem particularly ‘Christmassy’ – but bear with me, for this is what I would like to talk about in my Advent/Christmas Franciscan article. You know, I think both ARE extremely Christmassy, because both are about giving and sharing. The highlight of the year in terms of parish life surely was the Ox braai. Different, unusual and possibly a first for Waterkloof, this event was an enormous success. Incorporated into our glorious Patronal Festival (through the huge generosity of one of our parishioners), it enabled us to have a wonderful day of fellowship and fun (I am tempted to say ‘in the sun’) and, what made the day particularly special, we were able to share it with the congregation of St Mary’s Refilwe. St Francis of Assisi has donated R65000 to St Mary’s towards the building of their Church. Another wonderful dimension of parish life at St Francis of Assisi this year (which also formed part of the warp and woof of our Patronal festival) was the Stations of Service exhibition in the hall. This afforded the opportunity for all to see a collection of projects in which parishioners are involved, thus identifying opportunities to enlarge their effect in the communities in need. We need to continue to seek ways of becoming involved and the suggestion that we join a house group (many of which participate in one or two projects) or even launch new projects, must follow us into 2007. I’ve focused on these two events because they are indicative of the missionary-mindedness of this parish. While the vivid experience of the Patronal Festival is still fresh in our minds (who will forget our glorious procession with the front group on verse 11 and the back group on verse 2? ), and especially over this season, we can and must take time to reflect on the message it gave. Parish life in 2007 must continue in this generous vein – and I am not talking about money. A Church that is hung up on maintenance at the expense of mission is bound to implode as it focuses unhealthily on its own state of affairs. Having said this, we have some very exciting building projects in the pipe-line next year where, amongst others, we will be transforming our hall into something special. That is something for all of us to be excited about and get involved in. I personally cannot wait. Lastly, the joy of having Megan Winn on board in terms of our youth knows no bounds and already, as she leads 11 of our young people to the December Leadership Camp, we look forward to an exciting 2007 as regards that most pertinent group of all: the young adults. I seem to have lost my ‘Christmassy’ way a bit, but yes, St Francis of Assisi as ever, was and is a hive of glitter, light, generosity, promise, giftedness and, my goodness, so much more. And may that continue to be our calling in 2007. May you all be richly blessed over this season. May the Christ Child fill your lives with peace and may the angels’ message ring in your hearts. For those who are travelling, we look forward to seeing you, refreshed, in the New Year. The healing mission led by Ellel ministries was indeed a surprise to the very small group who attended. It was quite unlike any other experience (AND FOR SOME Anglicans I think it felt a little threatening! ), but so many blessing did come from it, not least of all the gentleness evident in Derek and Beryl Puffet who led the weekend. From my perspective there is no-one who does not need some kind of healing – we are so vulnerable in this world of disappointments, stress, poverty, crime, sickness and loss. However, most of us tend to bury our deepest hurts and put on the proverbial “stiff upper lip” to convince everyone that all is well. One simply needs to attend a small group fellowship to know that we are ALL broken in some way and Jesus offers us his healing touch whenever we risk reaching out to Him. I believe it is that risk that we were called to make at the weekend. This was the way I experienced the mission. The teaching was based fully on scripture, which made me comfortable with it. My main reservation regarding this series was that we needed more ministry time, as I believe it is simply impossible to listen to teaching for 45 minutes or more without any kind of break or involvement from the listener. The teaching was captivating and there were a variety of speakers. The talk on sexual soul ties was quite a graphic presentation of the damage that sexual encounters outside of marriage can do, without the people concerned even being aware of the power of a spiritual connection to another. There were also clear links made in other talks to the spiritual battle being fought over the lives of addicts (drugs, alcohol, gambling or sexual addiction). It was also an eye opener to discover how the emotional experiences of a mother can affect the unborn child. In fact, I came away convinced that the battle we fight on earth is not just a physical one but a powerful battle in the heavens and we must not be complacent about this. THIS WORK IS ABOUT A GOD WHO CHANGES LIVES. This was the invitation we received from the Nederduitch Hervormde Kerk in Danville and so, on 15 November 2006, six of us from the Soup Kitchen, as well as June de Klerk, set off for Pretoria West. After a few scenic, but unplanned, detours here and there, we found the church and a welcoming group of Elandspoort parishioners. The St. Francis Soup Kitchen has been involved with donating food to Danville during the last two years or so. Although our main commitment is to provide the Salvokop Shelter with food weekly, there are times when the “harvest” from Woolworths and Menlo Park Market Gardens is very plentiful, and we are then able to share it with Danville as well. At the church, we met some of the people involved in distributing this food to the needy, as well as some of its recipients. We met Koos Conradie, 87 years young, who goes to the Pretoria Fresh Produce Market weekly to buy supplies of fresh fruit and vegetables. These supplies are then sorted into food parcels, along with bread and other items. The parcels are given out each Wednesday morning at the church, to those families identified as being in need. At present, between 30 and 40 families within the Danville community are receiving these food parcels on a regular basis. Those needing assistance include the unemployed, as well as pensioners receiving a State Pension of only R820 per month. Dominee Herman van den Berg of Elandspoort thanked both the St. Francis Soup Kitchen and members of the NG Kerk, Centurion, for their support of Elandspoort’s work. Basing a few thoughts on Psalm 23, he said that though some people are ‘givers’ and others ‘recipients’, we are all recipients of God’s blessings, in one form or another. He is the Shepherd who tends to the needs of His flock. Dominee van den Berg also stated that since the end of apartheid, previous barriers between churches have been broken down, and churches now need to continue working together for God’s Kingdom. The morning ended with a wonderful tea and spread of eats. As members of the Soup Kitchen, we really appreciated getting to meet some of the people receiving food donations from us, and also appreciated the hard work done by members of their congregation in seeing to the needs of others. May Dominee van den Berg, Chris and Lettie Snyman and their team continue to be a blessing to that community! My friends, Peter and Margaret Barton, have spent their working lifetime in the service of the Anglican church and now they are spending their ‘retirement’ doing locums in places as far aprt as Copenhagen, Pittsburgh and Cannes. Peter ‘retired’ as Canon of Malmesbury Abbey and settled in the market town of Crewkerne in Somerset. That was where we met and where our friendship began. The Barons’ latest locum took them – and happily, me – to Versailles in July this year. We moved into the rectory which is adjacent to the church. The incumbent rector, Paul Kenchington, takes care of the Versailles chaplaincy of St Mark’s and also of St Paul’s in nearby Gif-sur-Yvette, both of which are part of the Archdeaconry of France within the Diocese of Europe. Their patron is the Intercontinental Church Society (ICS), which is a charity based in England. Its vocation is to support the English-speaking ministry throughout the world. When exactly the St Mark’s chaplaincy came into being isn’t quite clear, but the first available records concern the funeral of a British soldier who died, most likely from wounds received during the Battle of Waterloo. It was originally housed in a small church, but with the growth of the congregation following the UK’s admission to the Common Market, plans were made for the development of a new church centre. This was done in stages and now St Mark’s has an area accommodating 150 people for worship, two rooms for Sunday school use, a large foyer, sacristy, counselling room, kitchen and toilets. There is also a small shop and a rather romantic chapel converted from a former stable which houses fittings from the original church. St Paul’s, on the other hand, is housed in a Centre for Worship owned by the Gif municipality and is used by five different religious communities. 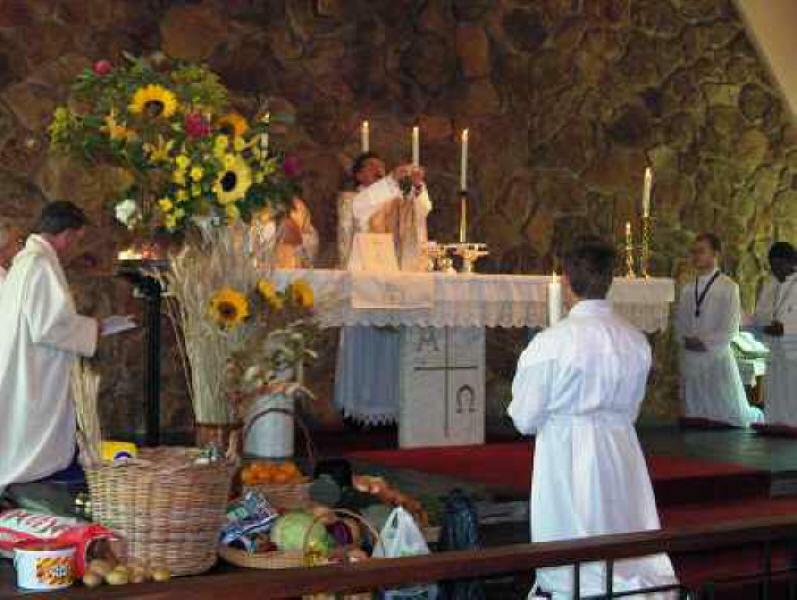 The Anglican service takes place on Sunday evenings. The first thing that strikes one about St Marks’s is the number of children and young people in the congregation. Of the 80 or so people making up a typical Sunday congregation, more than a third are under the age of 20. Most church members are ‘long term’ residents of the area, but a substantial number are there on ‘a few years’ basis related to their work. There are also a good many visitors, particularly during the holiday season. Coffee times after Sunday service are a treat with a great cross-section of participants. I met a Nigerian ophthalmological surgeon (whose husband happened to be in Pretoria at the time), a ‘diaconesse’ from Cameroon, a Disneyland executive and an Irishman dealing in pizzas and ladies’ underwear – all in a single morning! The chaplaincy’s activities are numerous and varied. Area-based prayer groups meet once a week for prayer, Bible study and other small-group activities in which, being in France, food plays a significant role! Prominent is Operation Stephen, a breakfast provided for the homeless and others every Saturday morning, staffed by members of the area groups. The guests tuck in ravenously. Most must have a touching tale to tell, but no questions are ever asked. I was rather taken aback when a man, croissant crumbs on his sleeve, told me how much he detested Marmite (the French in general seem to hate it!) although he neglected to specify how, when or where it had insulted his palate! Other church activities include walks (the surrounding countryside is super), treasure hunts, Alpha courses and courses on parenting, as well as a workshop for children at the end of summer. Peter tackled the services with originality and terrific enthusiasm. The feeding of the five thousand was illustrated with, among other things, mackerel and bread rolls we brought with us from England – no foreign food for us! Between Sundays we were free to explore the Palace of Versailles at our leisure (and without any fear of the guillotine). My previous visits on coach trips hadn’t impressed on me the enormous scope of the place – we made six visits, including some which had to be specially booked with a strictly limited number of participants. The fountains were switched on one Saturday and we needed to hire a golf cart so that we could see them all – more or less impossible on foot. I’ve been privileged to be the camp following in both Copenhagen and Versailles and I certainly hope Peter’s ‘retirement’ will continue to be as ‘restful’ as it has until now! In this double focus on past and future, Advent also symbolizes the spiritual journey of individuals and a congregation, as they affirm that Christ has come, that He is present in the world today, and that He will come again in power. That acknowledgment provides a basis for Kingdom ethics, for holy living arising from a profound sense that we live "between the times" and are called to be faithful stewards of what is entrusted to us as God’s people. So, as the church celebrates God’s inbreaking into history in the Incarnation, and anticipates a future consummation to that history for which "all creation is groaning awaiting its redemption," it also confesses its own responsibility as a people commissioned to "love the Lord your God with all your heart" and to "love your neighbor as yourself. Extract from Travels with Charley by John Steinbeck, winner of the Nobel Prize for Literature in 1962. Author of novels such as The Grapes of Wrath and Of Mice and Men, Steinbeck recounts in this book his travels across America in his truck Rocinante, with his dog Charley as his companion. Sunday morning, in a Vermont town, my last day in New England, I shaved, dressed in a suit, polished my shoes, whited my sepulcher, and looked for a church to attend. Several I eliminated for reasons I do not now remember, but on seeing a John Knox church I drove into a side street and parked Rocinante out of sight, gave Charley his instructions about watching the truck, and took my way with dignity to a church of blindingly white ship lap. I took my seat in the rear of the spotless, polished place of worship. The prayers were to the point, directing the attention of the Almighty to certain weaknesses and undivine tendencies I know to be mine and could only suppose were shared by others gathered there. The service did my heart and I hope my soul some good. It had been long since I had heard such an approach. It is our practice now, at least in the large cities, to find from our psychiatric priesthood that our sins aren’t really sins at all but accidents that are set in motion by forces beyond our control. There was no such nonsense in this church. The minister, a man of iron with tool-steel eyes and a delivery like a pneumatic drill, opened up with prayer and reassured us that we were a pretty sorry lot. And he was right. We didn’t amount to much to start with, and due to our own tawdry efforts we had been slipping ever since. Then, having softened us up, he went into a glorious sermon, a fire-and-brimstone sermon. Having proved that we, or perhaps only I, were no damn good, he painted with cool certainty what was likely to happen to us if we didn’t make some basic reorganizations for which he didn’t hold out much hope. He spoke of hell as an expert, not the mush-mush hell of these soft days, but a well-stoked, white-hot hell served by technicians of the first order. This reverend brought it to a point where we could understand it, a good hard coal fire, plenty of draft, and a squad of open-hearth devils who put their hearts into their work, and their work was me. I began to feel good all over. For some years now God has been a pal to us, practicing togetherness, and that causes the same emptiness a father does playing softball with his son. But this Vermont God cared enough about me to go to a lot of trouble kicking the hell out of me. He put my sins in a new perspective. Whereas they had been small and mean and nasty and best forgotten, this minister gave them some size and bloom, and dignity. I hadn’t been thinking very well of myself for some years, but if my sins had this dimension there was some pride left. I wasn’t a naughty child but a first rate sinner, and I was going to catch it. I felt so revived in spirit that I put five dollars in the plate, and afterward, in front of the church, shook hands warmly with the minister and as many of the congregation as I could. It gave me a lovely sense of evil-doing that lasted clear through till Tuesday. I even considered beating Charley to give him some satisfaction too, because Charley is only a little less sinful than I am. All across the country I went to church on Sundays, a different denomination every week, but nowhere did I find the quality of that Vermont preacher. He forged a religion designed to last, not predigested obsolescence.